Julia Metro serves as NOD’s Associate Director of Development helping shape and execute the organization’s philanthropic and corporate engagement strategies. 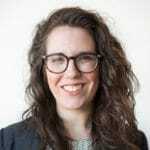 Prior to joining NOD, Julia served as Manager, Donor Services for Brooklyn Community Foundation where she helped build out their donor advised fund program and shaped engagement strategies for individual donors around their personal philanthropy in Brooklyn. Previously, she also coordinated development and fundraising efforts for Friends of Materials for the Arts, the nonprofit partner of Materials for the Arts, NYC Department of Cultural Affairs. Julia received her B.A. in Art History and French from New York University in 2009 and currently serves on the Brooklyn Chamber of Commerce’s Young BK committee. A proud Massachusetts native, she currently lives in Park Slope, Brooklyn.